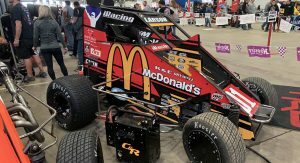 Monster Energy NASCAR Cup Series driver Kyle Larson moved one step closer to earning his first career Chili Bowl Midget Nationals title after winning Tuesday night’s preliminary qualifying night feature in Tulsa, Oklahoma. After starting second in the A-Main, Larson took over the lead on Lap 6 and never looked back, cruising to victory in the No. 01 McDonald’s Keith Kunz Motorsports dirt midget. Larson is now locked into Saturday night’s finale where a Golden Driller trophy and a chance to etch his name in history are on the line. RELATED: Questions answered about the Chili Bowl | Can Christopher Bell three-peat? “It’s always good when you get locked in,” Larson told NASCAR.com Wednesday. “I like racing early in the week so you can see how your mood is going to be for the rest the time here in Tulsa. Last year, Larson won his respective qualifying night, but an expired engine while leading the A-Main finale with 10 laps remaining allowed NASCAR Xfinity Series driver Christopher Bell to earn his second straight Chili Bowl triumph. With a win under his belt and confidence always running high when he’s on the 1/5-mile indoor clay oval, Larson is reluctant to get too anxious or excited based on previous experiences. “I literally had bad luck for the past six years or seven years,” Larson said. “If it doesn’t happen on a prelim night, it seems to happen to me on a Saturday. I don’t know. Every year I come in hoping and praying this is the year I don’t have bad luck. But in the meantime, Larson has plenty of time to prepare, relax and enjoy time with his fellow dirt-racing peers before it’s time to hop back into the car for Saturday night’s marquee event, cluing us into what he’ll be doing to pass the down time. Draft: Who's your No. 1 pick?